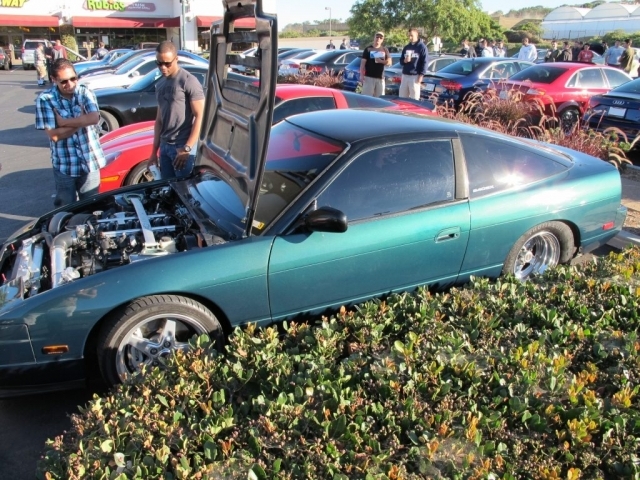 Went to the local last-Saturday-of-the-month car thing and driving to it, learned about how cold weather affects Midlana: the engine makes more power due to a denser charge, being turbocharged, the intercooler works better, which means even more power, tires don’t stick when they’re cold, and with the straight pipe (for the upcoming trackday) it’s even more power. Result: wheel spin on-demand in second gear, which is good to about 75 mph). Good to have safely become aware of this trait! My brother advised me to reserve about 15 minutes for getting into my race gear and into the car; yup, he wasn’t kidding. Good to know how far ahead of time I need to start “the process” at the track. 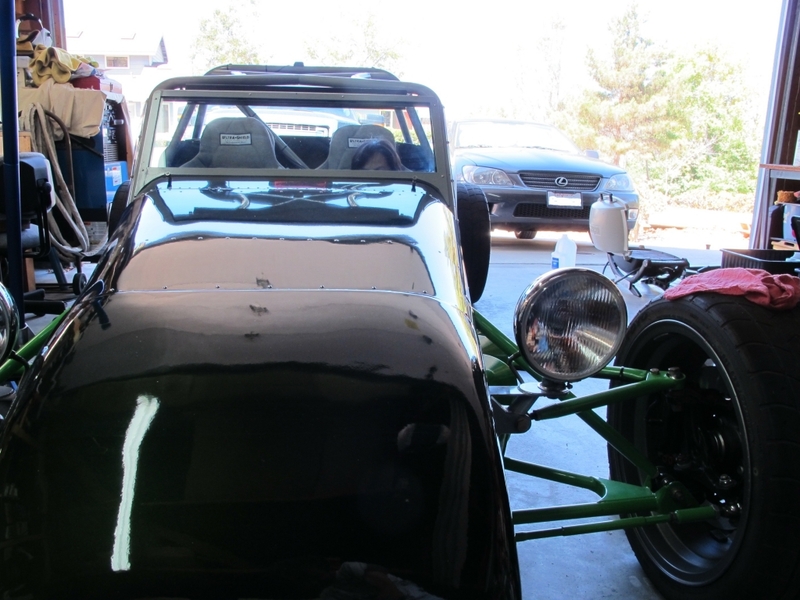 Related to this was discovering just how close I cut it for clearance to the roll cage. 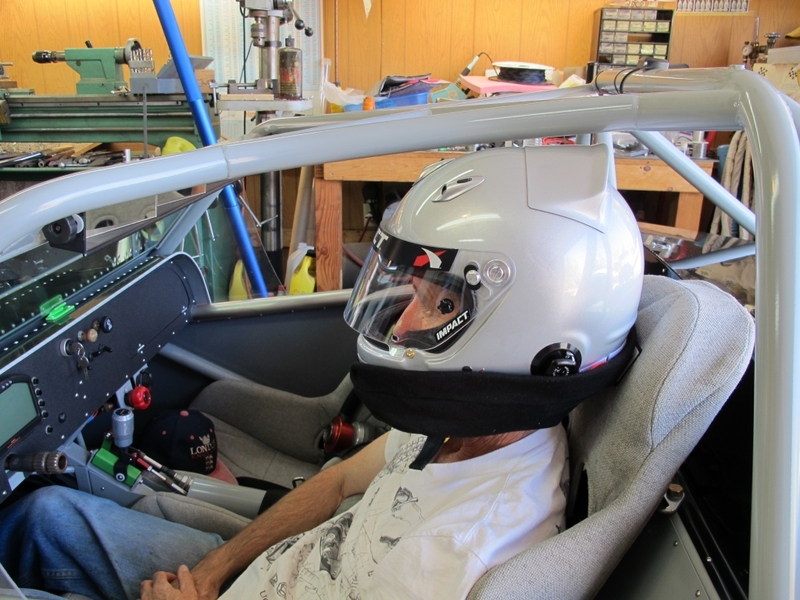 There’s several factors at work here: the helmet obviously has a big fin on it, I’m not belted in, and I’m slouching a bit. What it means is that it <em>just</em> clears when the belts are cinched down. As long as I keep my head back it’s fine, but looking down at my seatbelt buckle results in a “bonk” if I’m not paying attention. Somewhat related, my wife was up to no good in the car and it was pretty funny how much headroom she has! Speaking of sketchy traction, there’s an excellent YouTube http://www.youtube.com/watch?v=1jF__B1xpJY of a very good driver circling Goodwood this year in an authentic Ford GT40, on a wet day. It’s very impressive how he can go lap after lap right on the edge. Many drivers can pull this off for a few turns, but not likely for this long. Another Goodwood video is the 1950’s sedan event, just like how they used to race – very entertaining, http://www.youtube.com/watch?v=kXb243vn0jY. I need to go to a Goodwood event at least once. Got the first fifty pages back from the copyeditor and it’s another harsh wake up call regarding poor grammar. It’s a long painful process; every single page has multiple issues, but such is life as an amateur writer. Still around, just not much to report. Spent time with my elderly folks; I’m no longer my dad’s son but someone my dad apparently grew up with. Short of losing a child, I think this is about one of the most painful ways to lose a relative, powerless and watching them slowly drift away. Back to the book; currently working on getting the “front matter” squared away, copyright statement, disclaimer, dedication, intro, and page numbers where they’re supposed to be, that sort of stuff. My copyeditor buddy is working his way through the manuscript and will hand over the first installment this week. That makes the most sense because I can start making changes while he continues the editing. Picked up my brother’s enormous ice chest, lantern, tire temperature gauge, and a bunch of other stuff in preparation for The Big Trackday Weekend that happens in two weeks. My photographer/video buddy will be on-hand and I expect that we’ll get some awesome material: stills, track video, and what will likely become the promo video for Midlana. After the event, driving impressions and pictures will be added to the manuscript, the last additions before it’s moved to the last phase before release, draft copies. Took Midlana to a local car show but amongst the Porsches, Ferraris, Corvettes and Audis, she was a bit out of her element (whatever that is). During the show there was a homeless guy inspecting the cars and referred to mine as a “jalopy”, fair enough. Watching him lean on the Ferraris and Porsches I couldn’t help but think, “Well at least he didn’t pee in my car.” Now before anyone gets after me I’ll be the first to admit that the line between us and homelessness is a lot thinner than most of us think. All it takes is some bad luck and, boom, there it is, and having mental makes it all the easier, so my remark was for comedic effect only. Pushing ahead with the book means getting photos for the front and back cover. I have a buddy who’s a very talented photographer and who wanted to help out, so we did a photo shoot. He forwarded the photos he felt were suitable for the cover, then surprised me by also including what he called “an assemblage of B-grade video and stills.” I thought it was very well-done! http://www.youtube.com/watch?v=IdpbLVzQXrQ Oh, and I kept stalling the car because I was trying to avoid revving it too much and bothering people at our shooting site – not sure I succeeded. Meanwhile, work on the book continues, implementing red-lined corrections into the manuscript. Like the car, it’ll only get done if I keep at it.